Samsung offered a brief glimpse of its long-rumoured folding flagship smartphone, either dubbed Galaxy X or Galaxy F depending on who you talk to, during its annual developers conference in San Francisco last week. Although we got to ogle the Infinity Flex Display that powers the folding smartphone, we didn't see a whole lot else. That's because Samsung intentionally “disguised” the handset for the keynote and dimmed the lights to protect elements of the design. In the gorgeous new video, the Galaxy X is pictured with an all-glass design, similar to that seen on the Galaxy Note 9 and Galaxy S9, with a highly-polished aluminium chassis used for the border around the phone, as well as that all-important hinge. Just like the brief demo last week, the expansive 7.3-inch Infinity Flex Display unfurls without a hint of a crease or a fold down the centre of the OLED. This tablet-like display will offer more screen real estate for Galaxy X owners to binge-watch the latest season on Netflix, read a chapter of the latest page-turner in the Kindle app, flick through photographs, or enjoy a frantic mobile game. We already know that Samsung's all-new "One UI" Android skin will let users run three apps simultaneously on the tablet-sized display. According to the ConceptCreator video, the border around the device will be punctuated at regular intervals with speaker grills to help boost improve the sound when viewing content with the Galaxy X display unfolded. Apple uses a similar approach with its new iPad Pro to minimise the risk of users covering and muffling the speakers when holding the device. When the 7.3-inch screen is safely folded away, protecting it from scratches. Galaxy X owners can revert to the smaller 4.6-inch screen, which Samsung refers to as the "Cover Display", to quickly interact with their device – like sending a text message, or answering an incoming call. 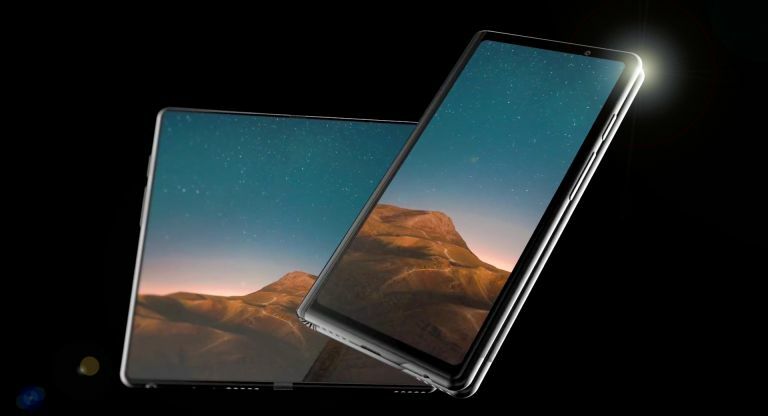 As users switch between the Cover Display and the 7.3-inch foldable screen, apps will jump between the two display sizes in the same state you left them. According to the ConceptCreator video, the Galaxy X will look almost indistinguishable from its rigid Galaxy S counterparts. On the back, there is a vertically-aligned dual-camera system similar to the one on the Galaxy S9. However, it's unclear whether the new set-up will keep the variable aperture feature that allows the Galaxy S9 to shoot in low-light conditions. Just like the foldable phone demoed during the Samsung developer keynote, the front of the Galaxy X will have much larger bezels than the 7.3-inch folding display. There is no fingerprint scanner anywhere to be seen in the video, which suggests the sensor will be embedded beneath the glass display. This is something already rumoured for the Galaxy S10, which is also scheduled to launch in early 2019. Samsung Senior Vice Present Justin Denison has confirmed the company is ready to kickstart mass production of the Infinity Flex Display in a “matter of months," which suggests a Galaxy X release date might not be far off. With CES 2019 and MWC 2019 fast-approaching, T3 will have all of the latest news around the Galaxy X as it breaks in the coming weeks. Stay tuned.